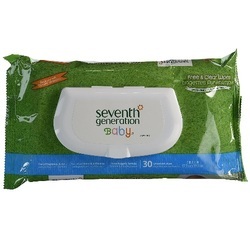 Seventh Generation Baby Wipes are moistened with natural aloe vera, vitamin E, and water to cleanse and moisturize gently and naturally. Unlike many traditional baby wipes, ours are fragrance free, not bleached with chlorine and do not contain alcohol or synthetic ingredients that can irritate baby's skin. Our one-at-a-time pop up dispenser is convenient and easy to use.